Amps—In search of 1 louder. Pedals—Because they make good guitars sound bad. Picks—All you want to know about tiny pieces of plastic. Strings—Guitars don’t work without them. Ode “Tut Taylor” Mandolin—Where I started. Has a Fort Robinson “I’m an early bird” sticker on the case from when I was six. 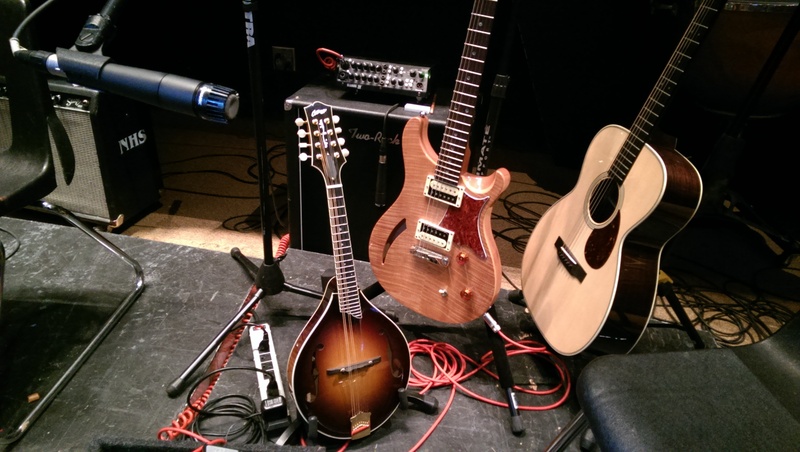 Mid-Missouri Mandolin Company Mandola—Pretends it’s an Irish Bouzouki most of the time. Godin Multioud Steel Prototype—I pestered Louis at Guitars, Etc. about these for so long that he convinced Godin to sell me one of the prototypes. Squire Vintage Modified Fretless Jazz Bass—I own a bass. I record with it. I am not a bass player. Alesis Fusion 8hd—Every kind of synthesis you need and good action. I love them, but most players ignored this ugly duckling. The Cloister—It was the studio, my bedroom, and a tiny kitchen crammed into what may be the smallest house in Longmont. Believed by some to be haunted. CMIC—Lessons, tracking, mixing, sound design… We did it all. Avid Protools—Sometimes it’s the only acceptable tool. Avid Sibelius—Until something better comes along. Csound—If it can’t be done in Csound it can’t be done. Cuckos Reaper—The best DAW for capturing hours-long jams. Harrison MixBus—As close as you can get to out of the box in the box. Tabledit—The long-lived French tab editor. I’ve used it constantly since last millennium.